Snow, crab and strawberries work in perfect harmony on this day trip to Gunma from Tokyo! 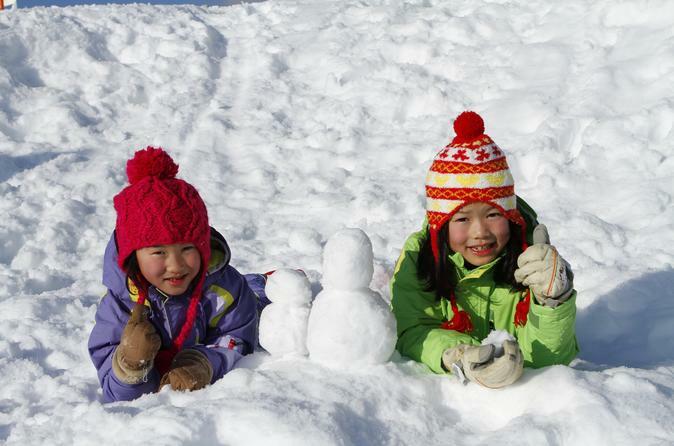 Enjoy the powdery white snow at Tambara Snow Land however you like and feast on an all-you-can-eat crab and shrimp lunch. Leave the ski park and head to Harada Farm to pick and eat delicious strawberries to end the tour on a sweet note. This tour is seasonal and runs yearly between December and April. The dates are subject to change. Meet your tour conductor at Shinjuku Washington Hotel at 7:50am from where you will get on a coach and head to Tambara Ski Park in Gunma Prefecture for some snow-related fun! Before you are released onto the snow, tuck into an all-you-can-eat buffet lunch featuring seasonal ingredients like crab and deep-water shrimp! You will have around 50 mins to satisfy that appetite or you can finish even earlier to start playing in the snow! Whether it’s a snowball fight, building a snowman, sledding (free rentals available) or something else, you are free to enjoy the snow as you please. This is a rare opportunity to channel your inner child for the day and bring back some nostalgic memories which you can share with your children! Make sure to prepare warm winter clothes, gloves and hats in advance as there is no rental option for such items. After around an hour of unadulterated fun, the tour leaves the ski park and makes its way to Harada Farm for a spot of shopping (20 mins.) Browse through the shop for some original homemade products like their famous baumkuchen cake. Conclude the day with strawberry picking on a farm in Gunma where you can hunt for the juiciest and plumpest berries available. If the sticky sweet juice is not running down your chin by the end, you’re not doing it properly! The tour then heads back to Shinjuku with a scheduled arrival at 18:00.